Several teams are ready to ship out big names as the NHL trade deadline fast approaches. Despite being very much in the mix for a wildcard playoff spot in the East, it appears the long-rumoured Rangers retool is imminent. Since GM Jeff Gordon took the helm in 2015, whispers that changes were coming have gotten progressively louder. 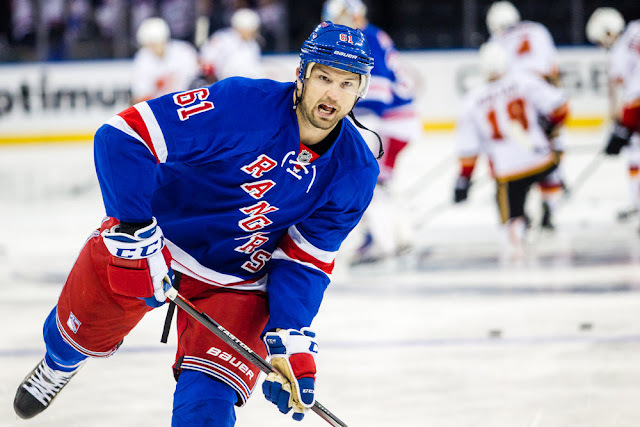 Rick Nash being on the block is nothing new, but big names such as Ryan McDonagh, Mats Zuccarello, Chris Kreider, and depth players Michael Grabner, David Desharnais and Nick Holden could be on the move as well. The teardown in Ottawa could begin at any time now, with rumours swirling around several key players. Mike Hoffman, Jean-Gabriel Pageau and Dion Phaneuf have been out there for a while, but Zach Smith is another name heating up. The Flames have emerged as a possible destination for Smith. St. Louis, Carolina and Boston are known to have interest in Mike Hoffman, though more teams should emerge in the coming weeks. Pageau intrigues Pittsburgh, but they surely won't be the only team involved. We'll keep an eye on this one as we inch towards the deadline. It's unclear what teams would be able to facilitate a Phaneuf trade, but the Sharks, Stars, Kings, Red Wings and Oilers have shown interest in the past. Things continue to heat up around Avalanche defenseman Tyson Barrie, who is no stranger to the rumour mill. Despite the Avs being in the thick of the playoff race in a surprising rebound season, teams continue to call on Barrie and it appears there is at least a willingness to listen. The Islanders, Maple Leafs, Canucks, Jets and Oilers have all been linked to Barrie in trade rumours.